SHAKEOLOGY // my daily dose of nutritious, delicious, natural, protein-packed superfood. it's an investment in my health! i have my chocolate vegan shake blended with ice and water every day after my morning workout. 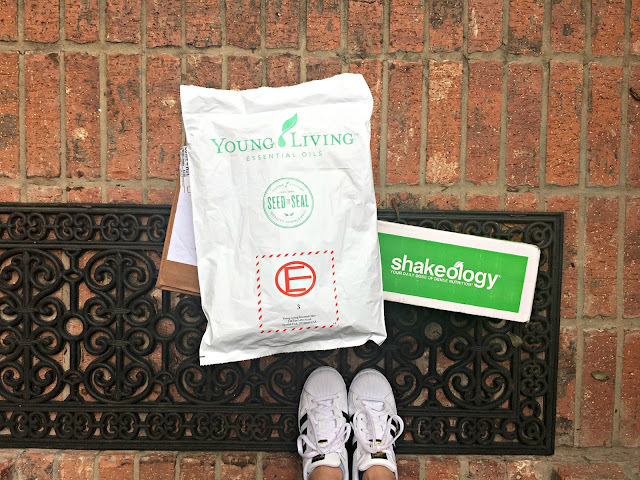 it tastes like dessert but acts like a superhero salad :) the big green box shows up on my doorstep and i'm like hello month's supply of healthy yummy lunches! to try Shakeology click HERE. RODAN + FIELDS // i've been using R+F for almost a year now and am amazed about what it has done for my skin. my issues were dark/sunspots and signs of aging. (sigh) i use the REVERSE regimen, the micro-exfoliating roller, REDEFINE night renewing serum, and the mineral peptide loose powder (medium). since using R+F i have noticed a remarkable difference in the way my skin looks and feels. dark spots are virtually gone! to try R+F for yourself, click HERE. BIRCHBOX // i was gifted a Birchbox subscription and now i can't imagine my life without it. i'll admit it, i'm a cosmetics sample junkie! it's super neat to be able to sample different (high end) brands and different products before paying full retail price for full size. there has never been a Birchbox with something inside that i didn't use and love. for 50% off your first Birchbox, click HERE. YOUNG LIVING ESSENTIAL OILS // "ah, it smells like home" -my family when they walk in the door. the air in our home smells fresh and uplifting thanks to my diffused essential oils! no soot or allergens or toxins in the air- just clean, pure, natural oils. currently diffusing Cinnamon Bark and Christmas Spirit - so warm and cozy! my next shipment will come with Clove oil and more Thieves. always Thieves. to order YLEO, click HERE. GROVE // i just got my Grove Collaborative shipment and wow what fun! we use Mrs. Meyers handsoap because it's free of harsh chemicals, but it is $4-5 per bottle at the grocery store! i can get it for less than that on GC. i also order our toothpaste (Dr. Bronners) on GC and it's at least $2 cheaper. i always find other products on their site that are better priced than the grocery store. for a $10 credit when you place your first order click HERE. COMPASSION // last but not least, one of my FAVORITE things to get in the mail is a letter from Joel, our sponsored child in El Salvador. we got some updated pictures of Joel recently and he is growing up so fast- makes my mama heart soar! his smile brings us so much joy. we love his letters! being a part of his life, even 2,000 miles away, is such a blessing to our family. to Sponsor a child through Compassion International, click HERE. "great is the Lord! He is most worthy of praise!"